I don’t know what it is, but every time I’m in a game that Monte’s GMing, I leave with inordinate food cravings related to some random foodstuff that was mentioned during play. Tonight it was diner food – bacon and eggs, all that. No diner food for me tonight, but now I’m home and enjoying cheese, crackers and ale. Which is actually even better. I also formally took posession of my new place tonight at 12:01AM, and came by with Hans and Robert to check it out. (And drop off the first few boxes – the contents of my Stanford office) It’s a great place; roomy, lots of light, and with stained glass windows, a fireplace, built-in bookcases, and a washer and dryer. And remarkably cheap. (Ah, what a wonderful thing a renter’s market is. Of course, it’s been pointed out to me that “remarkably cheap” by Bay Area standards isn’t quite the same as by any other standards on this planet, but that’s as may be.) Right now I need to decide where to put things, and get minor things set up: DSL, getting the power and the phone in my name, and setting up some curtains for the back door. And perhaps for the front porch as well; I’ll need to hunt around and find a good material. For those of you in the area, a housewarming party will probably occur at some point, although perhaps not in the immediate future. Good weekend. Spent much of it with Jenn, and that was good for a number of reasons which I won’t discuss here. (No, not just naughty ones. Honestly, you people have blue minds…) The picnicing on Sunday was particularly relaxing. Also, got to spend Sunday morning going to piano stores and looking. Right now, my roommate has a good digital piano, but he’s moving in with his gf, and I’m about to settle into this new place, which means… time to start thinking about one. Turns out they’re cheaper than I expected; there was even one selling for $1400, although I suspect that it would collapse in a pile of smoke and rubble the moment it got out of the store. Decent pianos seem to start around $4k. 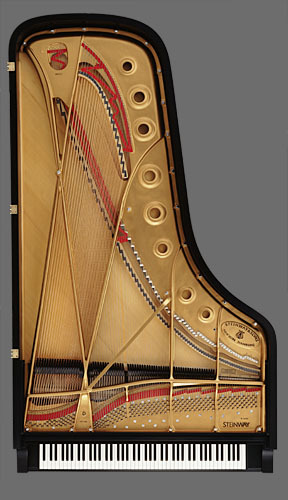 Steinway makes some uprights which (unsurprisingly) are excellent; those start around 8k. Which would make for a piano that costs more than my car did. I’m not yet sure how much I’m willing to spend on this. Obviously the expensive ones are going to require saving up for a while, and then likely financing part of it, but OTOH it seems kind of silly to spend $4k on something lousy. While there, though, I got to go into the “drool room” and play a bit. Steinway concert grands… wow… I think it’s more or less impossible to play anything that doesn’t sound good on those. That’s something that’s definitely on my “when I win the lottery” list, right after a house big enough to hold one. Address.. Email me your address.. yes the new one. And a new phone number when you get it.. Yes. And drooled. 🙂 Although I still prefer the Steinway 9′ concert grand over pretty much anything; they have a certain depth to their tone that nobody else quite seems to have. Tori Amos plays one (well, technically two). They sponsored her and gave her one to tour with — which was good, because at the time she couldn’t afford them. I love how they look inside. I haven’t seen the 9′ Steinways though. Got a link?